When is the last time you just "went for it" - culinarily speaking? I went to Caputo's Market for the first time yesterday. It's a 58 year old family owned store which now has branched out to 5 or 6 Chicago suburban locations. I bought a hunk of Parmigiano-Reggiano and all kinds of things at the deli counter - including an arancini. A woman behind me asked me what was in it. I said I had no idea. I was just going for it - trying something new since it was only 1.99. "Yes, but what's in it?" We ended up having a very enjoyable 20 minute conversation about food. I hope I see her and her husband in the market again. While it was warming and getting all fragrant, I looked it up on Wiki. 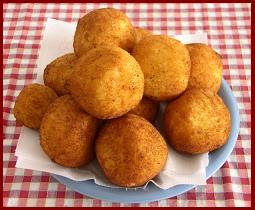 Arancini means "Little orange." Mine, I soon found out, contained rice, spinach, and some sort of cheesy stuff. It was unlike a Greek spinach pie - Spanikopita, which I love. It looked similar but tasted very different...and very good. Today, I encourage you, head to a market. Greek, Indian, Italian, Mexican, whatever is in your area. Find something inexpensive that looks fresh in their deli case and just try it. You might find the joy I found yesterday in a "Little orange."